The Red Squirrel: A Short Guide to Its Behavior And Ecology by Joseph Bahr gives a multitude of facts and examples that make squirrel watching as much fun, entertaining and calming as bird watching because squirrels are not just adorable but have a unique way of living that sets them apart from a lot of other mammals. The Red Squirrel is small, intelligent, and fascinating to observe and understand. From the grinding down of the incisors, the lofty tails that may help protect them, their travel and running habits, to their hoarding habits, these beautiful rodents are a pleasure to watch, learn about and understand. This guide shares more than just today’s species of squirrel; imagine discovering that squirrels have barely changed through the process of evolution over the course of millions of years! The Red Squirrel is a very informative and interesting guide that tells about the discoveries of many species of squirrel. The pictures, also provided by the author, show the beauty of squirrels in their natural environment, which lend the visual evidence that squirrels are just as adorable and interesting to watch as birds. I absolutely loved The Red Squirrel because I learned many things I did not know about these wonderful mammals; such as how the colors of their fur serve the great purpose of camouflaging them from above and below, and that squirrels are essentially color blind while relying on their large eyes to help them navigate and find food. 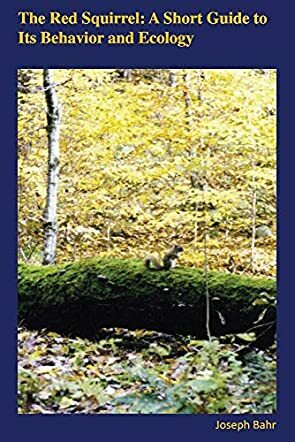 I recommend The Red Squirrel by Joseph Bahr to anyone curious about nature in general as well as anyone that loves to watch animals in their natural environment.